Strengthening community harmony and well-being by ensuring access to high quality holistic services which promote personal, family and community responsibility to health care. People feel good about themselves through a balanced spiritual, mental, emotional and physical well being. Strong families and harmonious communities in an atmosphere of trust. People live fulfilling lives despite disabilities and chronic illnesses. 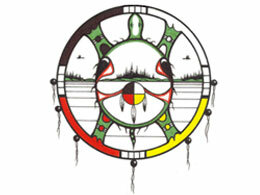 We live our Anishnabe way of life and cultural values by incorporating the 7 Grandfather Teachings. We live in an environment, which respects nature's balance. Individuals have the skills and knowledge to take care of their health. Individuals and families can access a variety of quality health services. Individuals are involved in healthy lifestyle activities which promote physical fitness, program nutrition and reduction of substance abuse. People understand their rights and can access contemporary and traditional health services of their choice. Holistic health balances traditional and contemporary service delivery. Equity in health status for the Anishnabe.